“The policies of America and its cheating crusader leader – without a doubt – clarified that the effective way in confronting its aggression is via the way of da’wah [proselytization] and jihad,” Zawahiri continues. He says bin Laden knew this all along, as the al Qaeda founder “repeatedly and continually assured [the Ummah] that its first enemy is America,” which is “the head of the snake” – a common description of the US used by al Qaeda’s leaders since the 1990s. Furthermore, according to Zawahiri, bin Laden preached that “the hostility between [America] and Muslims is a religious hostility at its core,” as it is really an example of the animosity “between the crusader material secular West” and the worldwide community of Muslims established by the Prophet Mohammed [Ummah]. Zawahiri goes by listing a series of attacks bin Laden’s organization carried out against American targets, including: bombings in 1992 at hotels in Aden, Yemen, the 1993 Blawkhawk Down episode in Somalia, the 1998 US Embassy bombings in Kenya and Tanzania, the USS Cole bombing, and the 9/11 suicide hijackings. “His brothers struck the Americans in Aden then in Somalia then in Nairobi and Dar as Salaam then in Aden again with an attack on the Cole destroyer, then came the greatest conquest in the American homeland,” Zawahiri says. 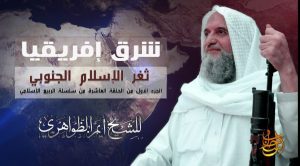 Zawahiri says “the goal of our jihad is the restoration of the rightly guided Caliphate” and all of the territory once controlled by Muslims from Jerusalem to Spain is still “ours.” Of course, this doesn’t mean al Qaeda thinks Abu Bakr al Baghdadi’s Islamic State (ISIS) is the answer. Al Qaeda rejects Baghdadi’s caliphate project as illegitimate, and the two jihadist organizations have rivaled each other for power since 2014. Zawahiri focused on East Africa, portraying Somalia and the surrounding countries as the targets of Western imperialism and colonialism. Zawahiri says the US and its allies have attempted to bolster moderate and Sufi forces in East Africa to fight Shabaab, an al Qaeda branch. And he offered a brief, yet selective, version of the history of East Africa as well. But Zawahiri quickly pivoted to an attack on Abu Bakr al Baghdadi’s Islamic State. Zawahiri accuses Baghdadi and his lieutenants of seeking “to destroy” the work of “the pioneers” of jihad, “such as Sheikh Osama…and his companions,” who “sought to unite the Muslims and the mujahidin.” The al Qaeda honcho charges that the Islamic State has overseen “the splitting of the rank” and the “violation of allegiance,” meaning the bayat (oath of allegiance) that many jihadists swear to their emir. Al Qaeda argues that Baghdadi himself broke his bayat to Zawahiri and then encouraged other jihadists to do the same. The al Qaeda emir notes that Baghdadi’s “spokesman” (Abu Muhammad al Adnani, who was killed in Aug. 2016) announced “war on anyone who did not pledge their allegiance” to the Islamic State, fighting them as apostates. Zawahiri adds that when the US began its “air campaign on [Syria] and Iraq” in 2014, al Qaeda “offered” the Islamic State “an initiative to cooperate in repelling them.” However, al Qaeda “received” only “insult[s] and claims of being disbelievers and threats of shame and arrogance” in reply. Al Qaeda asked the Islamic State for an “official statement about the evidence of our disbelief,” according to Zawahiri, but Baghdadi and his men failed to provide a satisfactory answer. Both of Zawahiri’s new messages were quickly transcribed in English by at-Tamkin Media, an online outfit that regularly translates messages by al Qaeda’s senior leadership. The quotes above are based on Tamkin’s translations (see here and here), with some minor editing. You could accurately juxtapose it and say Islam is the Mortal Enemy of Civilized Western Nations! The RAT, Ayman Al Zawahiri, looks old and decrepit. Ready to meet Allah. Is Ayman al Zawahiri alive or dead as of March/2018? If this is true, which I believe it is (they say Zawahiri wants one 9/11-sized attack on Americans before he dies), then why is the US pushing the Afghans to the negotiating table with the Taliban to whom Zawahiri reports? If and when Zawahiri strikes his big blow, it will be a Taliban attack. Why surrender to that? Why has nobody forced the ISI to cough up Zawahiri (and Hamza)? If america is the enemy of Muslims then perhaps they should leave America and go back home where they are wanted.